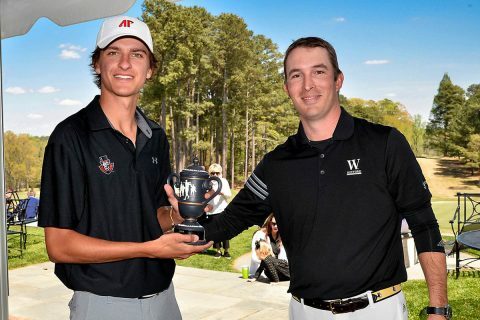 Spartanburg, SC – A career-best from freshman Chase Korte propelled Austin Peay State University men’s golf to its fourth top-three finish of the spring at the Coca-Cola Wofford Intercollegiate, hosted by Wofford at the Country Club of Spartanburg. The Govs posted a 288 in the final round, second only to eventual champion ETSU’s 276 and joined the Bucs as the only other team to shoot below 290 in all three rounds. Austin Peay’s 858 (286-284-288) put the Govs in third, behind the Bucs (843) and host Wofford (856) and ahead of Army (866) and Appalachian State (870). Korte was the story for the Govs in the final round; the precocious lefty shot 67, besting his previous career-low by three shots, and shot a career 54-hole best nine-under par 207 to take runner-up honors. He dueled eventual champion Geuntae Kim of ETSU to the last hole, matching him nearly shot-for-shot to finish two back for the tournament. The Metropolis, Illinois native sank 18 birdies, tied with ETSU’s Trevor Hulbert for most in the field, and led the tournament with a 2.83 average on par-3 holes, part of a larger emphasis on short holes by the Govs—Austin Peay tied Charleston Southern for best par-3 stroke average (3.15/hole) of the tournament. While Korte deserves all accolades headed his way, another freshman proved to be one to watch heading into the Ohio Valley Conference Championships two weeks from now. Garrett Whitfield finished just outside the top-10, with his two-under par 214 (73-70-71) good for 12th. He, along with Korte, was one of just three players to have a better-than-par average on par-3 offerings (2.92/hole) and he finished with 38 pars, second-most of the tournament. The talented trio of sophomores rounded out Austin Peay’s lineup, with Austin Lancaster (74-70-76—220) finishing tied for 24th, putting him squarely in the top-half of the field. Alex Vegh (71-74-77—222; t-30th) and Michael Busse (72-77-74—223; t-34th) put together quality 54-hole showings, with Busse equaling Korte for best par-5 scoring average (4.42/hole). Senior Hunter Tidwell, competing as the individual, finished inside the top-40 with a 225 (70-78-77), including 11 birdies. The Govs now await the start of the 2018 OVC Men’s Golf Championships, April 23rd-25th in Florence, Alabama at the Robert Trent Jones Golf Trail at the Shoals.